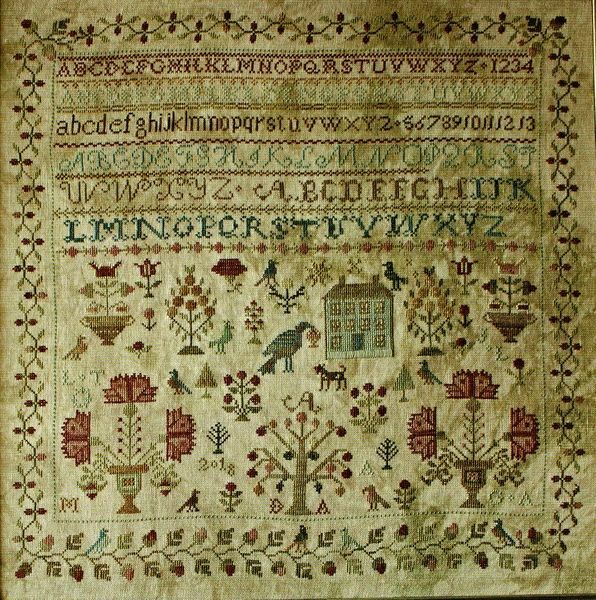 A traditional alphabet sampler re-created by Alma Allen. The booklet has black and white charts printed 10 stitches to 1.5 centimetres on six A4 pages, two with key. The pattern is worked in whole cross stitch and a few Smyrna crosses over four using two shades of Gentle Arts floss mountain mist, old hickory, 12 shades of Weeks Dye Works ODF-1330 baked apple (2 skeins), ODF-1271 bark, ODF-1229 chickpea, ODF-1123 cornsilk, ODF-1240 dirt road, ODF-1171 dove, ODF-1236 mocha, ODF-1232 palomino (2 skeins), ODF-1201 putty (2 skeins), ODF-1336 raspberry, ODF-2253 sanguine, ODF-1237 swiss chocolate and two of Classic Colorworks CCT-194 dublin bay, CCT-218 blue corn or DMC substitutes. 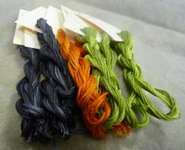 The design requires 19 skeins and is stitched over 273 by 275 stitches. The model was worked on 36 count linen.